Crane Control Equipments was established in 1988 at New Delhi (India) and under the guidance of Mr. Mukesh Malkani we have come a long way since then. We have a huge clientele of both public and as well as of private sector. We provide solution for customized manufacturing also and have been serving some of the important public sector industries like railways, electricity board and some key players in private sector. We offer the products like: Radio Remote Control, Master Controller, Cable Trolleys, Rotary Limit Switch, Counter Weight Limit Switch, Electro Hydraulic Thrusters, Electro Hydraulic Thruster Brakes, Resistance Boxes, Flexible Geared Couplings and Bus Bar Conductor. Our huge clientele includes Bhilai Steel Plant, Maruti Udyog Ltd., National Fertilizers Ltd., Tungabhadra Steel Products Ltd., Bharat Heavy Electricals Ltd., Northern Railways, Eastern Railways, Rail Coach Factory, U.P. State Electricity Board and many more. We are known for our quick supply through our well established dealers across the nation. Range of products offered by us are cable trolleys, flexible geared couplings, starting resistors, counter weight limit switch, rotary limit switch, electro hydraulic thrustors, electro hydraulic thrustor brakes, shrouded bus bar conductor, radio remote control and master controller. Chittaranjan Loco Motive Works, Chittaranjan. U.P. State Electricity Board, Kalagarh. Our vision is “commitment towards our customers” for all our manufactured products. 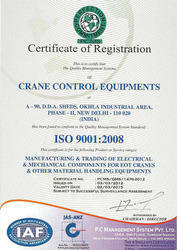 And we strive to maintain the stringent quality control in all our activities to cater the needs of our huge clientele. Our team of experts makes some of the best known products keeping in mind the needs and desires of our clients without compromising on quality.